Lining the mantel in bright bowed stockings makes for a very merry Christmas display. Homemade stockings are an easy way to bring in personalization and your own festive style to the season. 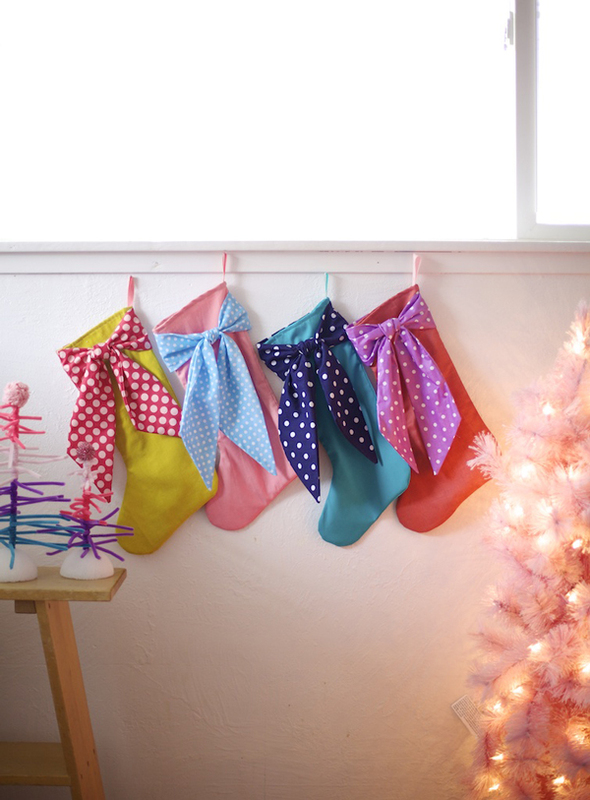 They are a simple sewing project to pull together, and if sewing an entire stocking seems overwhelming this time of year, read on and add the bright colorful bows to stockings you may already own, or gussy up an affordable pair from the store for gifting this season. 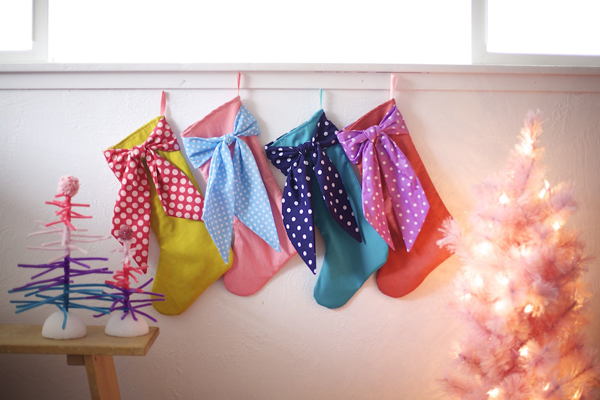 To make these bright bow stockings for your mantel: Start by tracing a favorite stocking pattern (or trace a stocking and add 1/2” to all sides) and cut two pieces for each stocking out of brightly colored fabric, and two each out of a lightweight lining fabric. With the right sides together, sew stocking pieces together, leaving the top open, then trim corners with pinking shears. Turn the outer stocking piece right side out and stuff the lining inside. Fold top edges over twice and hem. 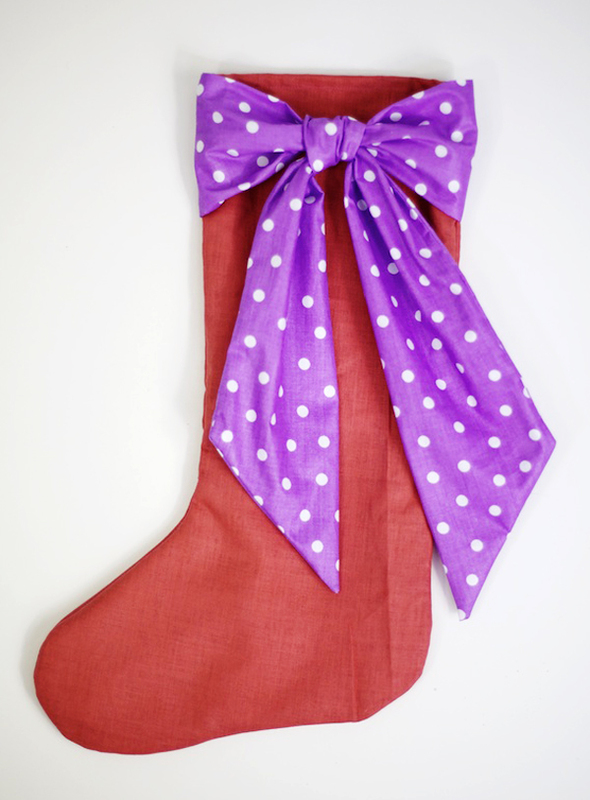 For a stocking with a 7” opening, cut a cuff piece out of coordinating polka dot fabric that is 8”x8”. Fold in half and sew along edge (adjust to match the size of your stocking and add 1” seam allowance). Fold cuff in half with right sides facing outward and sew with edges turned under. Cut an 8”x28” piece of coordinating polka dot fabric and fold in half widthwise with right sides facing. Trim ends off diagonally and sew along the open edge, leaving a 1.5” opening in the middle. Turn right side out and sew opening closed. Slide cuff piece onto stocking and stitch each side to keep in place. tie strip onto the middle. Sew a 5” loop of ribbon to the top to hang. so cute!! 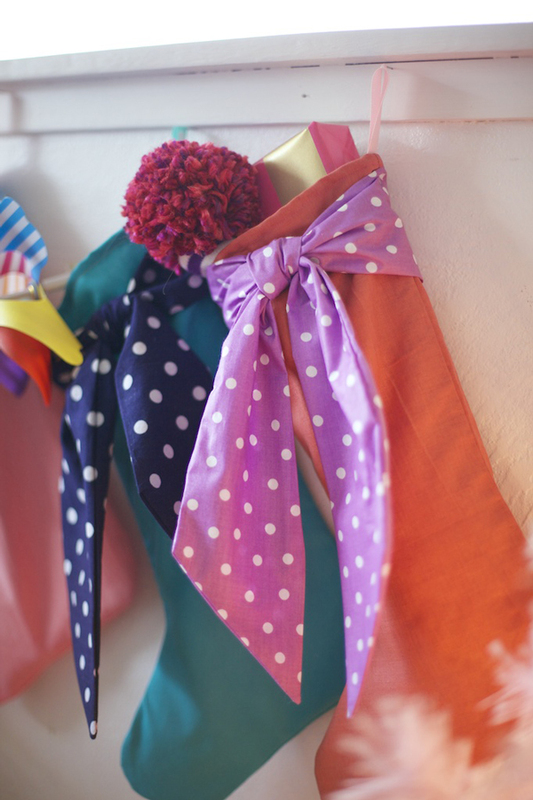 I adore the polka dot ribbons! 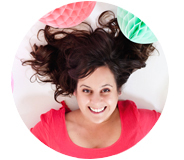 So cute, but I was wondering – was it a conscious decision to no longer post photos/full articles to RSS? I really like your blog but I read mostly through Feedly while I’m at work/running errands, so clicking through to the browser every time, means I’ll normally unsubscribe from a blog. Just wondered because it started less than a month ago, and I assumed it was a bug at first, but now I’m not sure. Disney, You never cease to amaze me! I’m putting these on my sewing list for next year. So cute! We have some really special handmade stockings that I wouldn’t give up for the world, but in all honesty, of all the other stockings I’ve ever seen, these are the best. I am crazy about them. Thanks for this posting. I’ve followed the link from craft gossip and just whipped up a cute stocking for my youngest with pink sari fabric from an old skirt of mine paired with black and white polka dot fabric. As a fairly self and google (!) taught sewer I found the instructions a bit more tricky to follow than a step by step pics blog, but I persevered and got there. So thank you muchly.